This article originally appeared on GapYearAfterSixty.com. Lethal injection is not the only way to assert some control over how you die when you are old and suffering from a terminal illness. You might not know that if you read the recent piece by Catherine Porter in the New York Times: At His Own Wake, Celebrating Life and the Gift of Death. 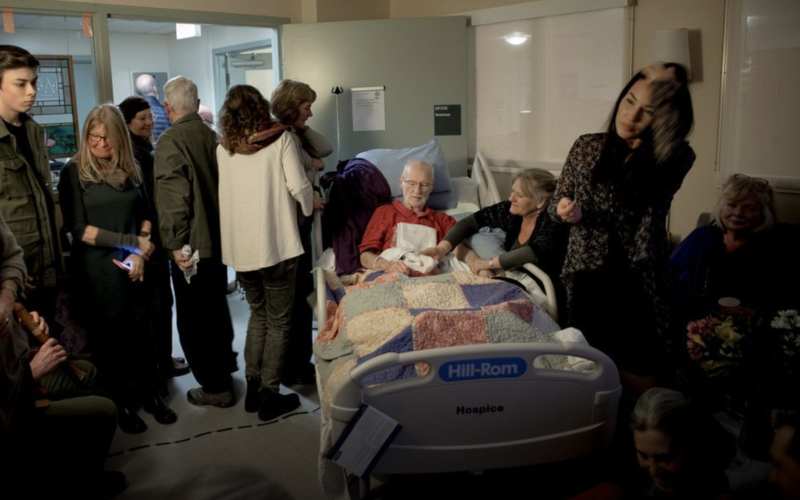 It relates the story of John Shields, a 78-year-old social activist in British Columbia, who choreographed his death using the new Canadian law that allows physician-assisted suicide by lethal injection. The article illustrates many of the ironies and inconsistencies that challenge patients and physicians when approaching death with a terminal illness at an advanced age. It also inspired over 800 comments, most of them from Americans and most of them positive and supportive in tone. Which says to me that many readers of the New York Times like the idea of an easy and quick way out. For better or worse, and as a physician I think it is for the better, physician-assisted suicide as practiced in Canada is not available to Americans. There, physician-assisted suicide can be administered either by a lethal injection, as performed on Mr. Shields, or by an oral solution. Most patients choose the lethal injection because it is perceived to be more reliable and easier for the patient. Here in the U.S., medical aid in dying, as it is called, is legal in six states: California, Montana, Washington, Oregon, Colorado, Vermont and in the District of Columbia. When a patient qualifies, he or she can be prescribed a combination of lethal oral medications that are to be self-administered at the time of their choosing. A doctor is not present. In the U.S., there is no lethal injection option. Euthanasia, or mercy killing, is illegal. Therefore, the majority of Americans don’t have access to self-administered medical aid in dying right now and never will have access to the lethal injection form of physician-assisted suicide. With self-administered drugs there is the risk of vomiting, of having trouble swallowing pills, and even of a paradoxical reaction (waking up instead of falling asleep). Yet by focusing on physician-assisted suicide and medical aid in dying, other options for hastening death at the end of a long life are forgotten or overlooked. A physician has dual, co-equal responsibilities. One is to prolong life. The other is to relieve suffering. Both of these responsibilities should be exercised with the teachings of Hippocrates in mind – and here I paraphrase – first, do no harm and second, refuse to treat when treatment is futile. It is common toward the end of a long life to find that the dual responsibilities, to prolong life and to relieve suffering, are in conflict with one another. When this incompatibility exists, physicians must turn to the patient for guidance. Here the patient’s autonomy and decision-making will determine the doctor’s emphasis on the care pathways, either to relieve suffering or to prolong life. Relieving suffering can include terminal sedation but in the U.S. that does not mean physician-administered treatments that intentionally result in death. Terminal sedation is a combination of narcotics and sedatives administered with the intent of reducing symptoms and with the knowledge that they might secondarily hasten death because of depressed breathing and weakened circulation, etc. So what are the options for elderly Americans? So what are the options available to elderly Americans who want to ethically, morally and legally hasten their deaths, but who do not have access to medical aid in dying? Note that I am talking about patients who are terminally ill, defined as those who have a less than six-month life expectancy as certified by two independent physicians. Well, the simplest approach is to decline any curative or life-prolonging treatment while at the same time embracing palliative care. Choosing to refuse treatment is an option available to anyone at any time and is particularly appropriate for frail, elderly patients. Choosing to refuse treatment for an illness that will lead to a manageable death (pneumonia is the common and classic example) results in a natural death that many family members find comforting. This option accepts the inevitable but doesn’t invite the aura of prematurity and impulsivity cast by physician-assisted suicide as practiced in Canada. My professional experience leads me to rank, in order of social ease and emotional comfort, the options by which a patient or their agent chooses to hasten death. When old, frail, or disabled by chronic disease, as Mr. Shields was, it is comparatively easy to decline aggressive and painful treatments such as cardio-pulmonary resuscitation, debilitating chemotherapy, and surgery. It is also easy but less common to decline more tolerable treatments such as antibiotics for pneumonia or a bladder infection – both of which will lead to comfortable deaths when appropriately treated with palliative medications. Ironically, weeks before Mr. Shields’ life was ended by a physician’s injections, he was saved with antibiotics from what appeared to be the confusion of mild or early sepsis. That is mentioned in passing in the NYT article and most readers did not seem to pick up on it. The quandaries of physician-assisted suicide (the timing? impulsivity?) could have been avoided if he had instructed his agent to decline those antibiotics. Emotionally, it is slightly harder to discontinue treatment once it has begun, although ethically and legally, refusing treatment and stopping treatment are equivalent. Mechanical ventilation on a breathing machine is an example of this. When death by respiratory failure is likely, refusing to be intubated is a painless, passive step that minimizes potential suffering, whereas withdrawing the breathing tube is an active step taken to end the suffering of mechanical ventilation and ICU care. It is slightly more emotionally difficult to withhold or withdraw treatment from a patient who is not fully competent although this is moral and ethical when the agent is acting on behalf of the patient according to pre-existing directives. And all Americans should understand that physician-assisted suicide and medical aid in dying are not available to patients who are incompetent. Voluntarily stopping eating and drinking (VSED) or death by self-dehydration is an actively passive step to hasten death that everyone should be aware of. A 2003 study of hospice nurses in Oregon, where physician-assisted suicide by oral medications has long been available, found that they thought VSED offered a better death than PAS. It is effective, fast enough to be tolerable, and slow enough to vanquish any familial concerns about an irretrievably impulsive decision sometimes associated with physician-assisted suicide. It is very challenging to withhold or to withdraw food and fluid from a non-competent patient. Yet, like any other medical treatment, it is completely moral and ethical to refuse or stop artificial nutrition and hydration (that which is given by feeding tube or IV) on behalf of a patient who has formerly established that directive while still competent. Hence, the crucial importance of having an advance directive. Finally, it is most emotionally and socially difficult to decline to manually feed a non-competent patient. In the U.S., manual feeding is defined as basic care in a minority of jurisdictions. In those, patients must be manually fed. In most other jurisdictions, it is considered a medical therapy that can be declined. Again, if, in advance of incompetence and where manual feeding can be declined, a patient defines manual feeding as a medical treatment and defines a natural death as occurring when food is supplied but assisted feeding is refused, I believe an agent is acting in the best interests of their ward when they avoid manual feeding except upon request. Having outlined some options for hastening death that are available to every patient, let me turn to a problem that I associate with physician-assisted suicide beyond the moral objections to it that some people hold. Opponents of physician-assisted suicide chant that “murder is not a medical procedure.” Except when it is. I was struck in the article by the logistics of timing as Dr. Green, Mr. Shields, and Ms. Hood (his wife) try to work out a schedule for the day of the lethal injection. Weeks after being saved from a natural death by sepsis, and days after meeting Dr. Green, the patient is advised by the doctor that because of a previously scheduled vacation with her husband she could schedule his death the very next day or after her return, two weeks later. How awkward a conversation is that? Is it coercive? Is it in his best interests? Already suffering from episodes of confusion, what if Mr. Shields had become less lucid over the following two weeks? A Canadian physician cannot perform the injections if the patient is not mentally competent and able to fully understand the gravity of the decision at the time of the injection. In this case Mr. Shields could hurry his decision, and risk a premature death, or he could delay his decision and risk the loss of whatever control, as he perceived it, that he sought. But there is no guarantee of control with any medical intervention. Witness Dr. Green’s plan to have two sets of medications if the first set did not work quickly enough. The one area over which all patients can assert control is the refusal of life-prolonging treatments. I do not presume to tell you how each individual patient should parse his or her own decision. I do encourage everyone to develop a vision of their death, knowledge of their illnesses, acceptance of the inevitable, an appreciation for palliative care, and an understanding of the end-of-life options available in their jurisdiction. Then they can maximize control of their death. Get updates on Sam's new book, download the full Introduction, find out where he will be speaking, and more.